A lot has changed since the 1930s but our commitment remains the same, to provide a mix of attractive investments for investors and attractive terms for borrowers. And, we do it well. Not many people can say they watched their father build an investment bank and full-service financial firm from scratch during one of the most challenging times in American History: The Great Depression. During this time, nearly 5,000 municipalities defaulted on their bonds, and the unemployment rate was a record 20%. However, the entrepreneurial spirit of Herbert Sims was tenacious, and where there seemed a paucity of opportunity, Herb was adamant that restructuring defaulted bonds would be the key to rebuilding America’s infrastructure and its prosperity – a true pioneer and visionary, he founded Herbert J. Sims and Co. Inc. in 1935 – known today as HJ Sims. In fact, Herb was among the first to use tax-exempt bonds to finance hospitals, senior living communities, and important structures like roads and bridges. Since then, Herb’s son, Bill, has had the unique first-hand experience of understanding the upward and downward cycles of the bond market. After a brief time in the bond department at Merrill Lynch, where Bill served as a liaison between the branch offices nationwide and the underwriting and trading departments in New York City, he joined his Dad in the family business. Bill continued Herb’s business model, gaining valuable insight into a variety of public sectors, including hospitals, natural gas systems, roads, bridges and causeways, and other infrastructure. Gleaning his father’s knowledge, Bill became intimate with the inner-workings of the nursing home industry, senior living sector, and real estate markets. Ultimately, Bill focused on the senior living sector at HJ Sims, while his father retained leadership of the hospital business. Bill is nationally recognized for his expertise in the senior living industry, where he has overseen the financing of hundreds of projects since joining the firm in 1973. His expertise also includes mergers and acquisitions as well as the restructuring and refinancing of distressed properties. Bill possesses esteemed skills, including the ability to market senior living bonds and an innate talent for numerical calculations. Bill is proud of HJ Sims’ growth and the investment banking team’s unique capability to create bond issues that are exclusively available to HJ Sims’ individual private clients, as well as subordinate debt and taxable investments available to accredited investors via private placements. One of the professional achievements of which Bill is most proud is the refinancing of Hebrew Senior Life’s NewBridge on the Charles (NewBridge) in the Boston metropolitan area. NewBridge is the largest start-up Life Plan Community (LPC) ever financed ($457 million via 10 letter of credit banks) and the largest LPC ever refinanced ($236 Million; BB+ rated; 40-year fixed-rate). Bill is proud of his long-standing client relationships, including Athena Health Care, which has been a client for 30+ years. For Athena, Sims was able to place $42 million in subordinate debt with its private clients in a single financing, simultaneously refinancing the first mortgage debt through its HUD subsidiary, Sims Mortgage Funding. Bill notes that his father’s most proud professional moment was the financing of the Intrepid Sea, Air & Space Museum, an American military and maritime museum located on the Hudson River in New York City. Bill has lived in Westport, Connecticut for 38 years. He has been married for 40 years and is the proud father of two daughters: Elizabeth (Izzy), who earned a Bachelor’s degree in Geology and Art History from Yale and an MBA from the University of Texas at Austin, and who serves as the Director of HJ Sims’ Wealth Management Consulting Group, and Amanda, who earned a Bachelor’s degree in Philosophy from Johns Hopkins University and a Master’s degree from Cornell University in viticulture and works in the wine industry in Sonoma, California. In his free time, Bill enjoys sailing small boats. 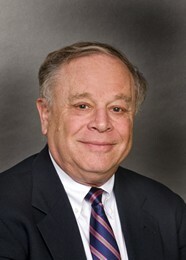 He is a past Chairperson and current Board member of a non-profit senior living community in Bridgeport, Connecticut. Bill was honored by Aging in America Inc. in 2005 and by The Miriam Osborn Memorial Home Association in 2008 for his contributions to senior living. Bill has been invited to serve as a guest speaker at dozens of investment seminars and is the author of numerous articles. Bill graduated from the Hotchkiss School, a private, college preparatory boarding school in Lakeville, Connecticut, and received his Bachelor of Arts degree from Yale University. He attended the Stanford University Graduate School of Business and earned his Masters of Business Administration degree from New York University, where he found himself researching his father’s own theory on utility revenue bonds.